Operation Iraqi Freedom is the name given to the invasion of Iraq on March 19 2003. Its objective was ‘regime change’ – a euphemism for the removal of Saddam Hussein from his post as leader of Iraq, and his replacement by a ‘democratically elected’ Iraqi government with whom the USA could ‘do business’. The casus belli was, according to US President George W Bush and UK Prime Minister Tony Blair, the ‘clear and material threat’ posed to their countries by Iraq’s ‘proven’ possession of ‘weapons of mass destruction’ (WMD). 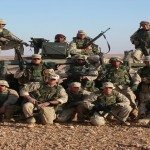 Now – long after Saddam Hussein’s execution, the ruination of Iraq’s economy and the effective sequestration of its valuable oil assets – Iraqi Freedom’s legacy of civil strife between Sunni and Shi’ite and Kurd merely multiplies the bitter ashes of the entire episode. As the UN’s Inspector said before it began, there never were any WMD. Bush and Blair lied about them, having planned to go to war with Iraq a whole year earlier. Iraqi Freedom is an ongoing disaster for Western democracies, for Iraq, and for truth itself. It shames us all. Death toll: By 2009 the total number of deaths as a direct result of the invasion and its aftermath had been estimated at 1,366,350. Nobody has ever counted the injured and displaced in Iraq. You should know: As early as July 23 2003, a US game company issued a PC game called ‘F/A-18 Operation Iraqi Freedom’, offering players the chance ‘to fly the Marine and Navy’s workhorse fighting machine, the F/A-18 Hornet, as navigated above Iraq, Iran, Kuwait and the Gulf during Iraqi Freedom’.